Small - $53.99 Only 3 left! Is your kid ready to get "All fired up"? Because the Skylands are in trouble. Seems that Kaos and Glumshaks are up to no good (unsurprising really, considering their track record). So we need the Skylanders! We know, we know, there are a lot of them. But that's okay! All the better to save the Skylands! Maybe we'll just start out with Stealth Elf, Eruptor, Jet Vac... and the team wouldn't be complete without the purple dragon himself: Spyro! Let's face it, if the Skylands need saving, having a purple dragon that can fly and spit fire will definitely be an asset. Even if he is a bit hot-headed, a magic dragon will do wonders when vanquishing the forces of darkness. Even if Spyro isn't battling Kaos, he'll be busy making sure the Golden Queen isn't escaping Cloudcracker Prison. He's a pretty busy fella. 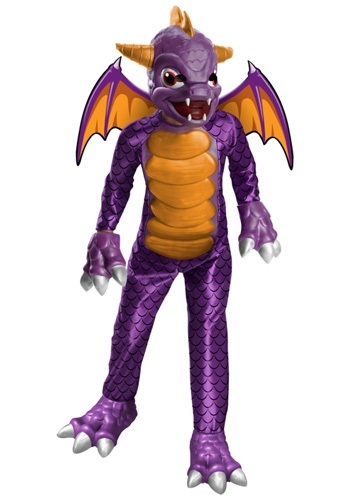 So if your kid is ready to save the Skylands, look no further than this Deluxe Skylander Spyro Costume. The outfit has a jumpsuit printed to look like scales with a foam belly. It comes with Spyro's purple and gold wings, and even covers for their hands and feet. Of course Spyro wouldn't be Spyro without his horns and snout, so the mask is included too! And, while we're sure your kid is talented, we recommend that they don't breathe fire while wearing the suit.